Cottage Paper: SALE-A-BRATION Is Here! 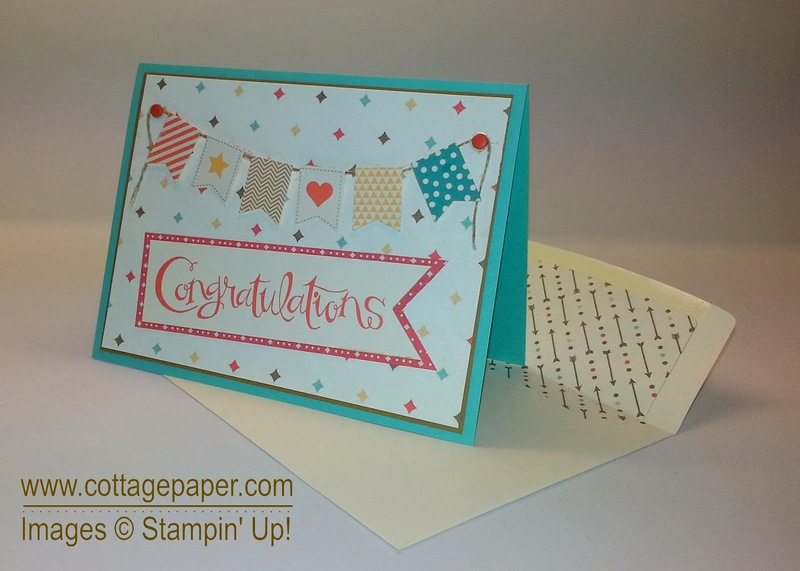 Sale-a-bration is Stampin’ Up’s biggest promotion of the year! Between January 28-March 31, for every $50 of Stampin’ Up! product that you purchase, you can choose one free exclusive gift from a choice of thirteen items included in the Sale-a-bration brochure. What exactly are these items? First there are four great stamp sets available. Banners are really hot right now and check out the seven cute banners in the Banner Blast set. In addition there is a little star, flower, and heart! These banners are a perfect fit for the Banner Punch (which is also available as a SAB choice) or they can be easily snipped with paper snips. Petal Parade has fun flowers, greenery, some scallops and a neat feathery chevron. How cute is the See Ya Later stamp set with four different graphics and really fun sentiment combinations? These combinations can be used individually or together in lots of different ways! Last is the You’re Lovely set which would make a “lovely” label for a card or other project. Plus it coordinates with the Deco Labels Framelits Dies. To see all the free items available during the SAB period click on the Sale-A-Bration brochure on the right of this blog. Here is a card that I made with the Banner Blast stamp set! This card was made in honor of my fabulous Stampin’ Up! upline Brian King. This week I found out that Brian had once again been recognized by Stampin’ Up! for the great job he is doing as a Stampin’ Up! demonstrator. Congratulations Brian!! You TOTALLY deserve it! I then decided I should make a congratulations card and the Banner Blast set seemed perfect! I looked for a Designer Series Paper to use on the card. DPS is great to use on cards because once you find a paper you automatically have all of your colors! I selected the new Retro Fresh paper that is on page 19 of the Celebrate the Everyday catalog. I LOVE this paper. I love all the fun arrows and the great colors! I thought Brian would like it to. (After all doesn't he have on a Coastal Cabana shirt in his avatar?) I punched out the Banner Blast images with the Banner punch that is also available as a free SAB gift but you could also use some paper snips. I thought the congratulations sentiment from the Sassy Salutations set went great with the banners. I used the Banners Framelits Dies to create the flags on the sentiment piece. Though my piece is much narrower that the largest Banner Framelit I was able to use the Framelit to create just the flag tip on the sentiment and on the DPS layer under it. You could also create the flags with paper snips. To order click on the ordering tab just under the header above. You can email me privately with any of your papercrafting questions or ask them in a comment below! Katie - what a super-sweet card! I absolutely love the colors you used and appreciate the kind sentiment.